When it comes to antivirus programs, the McAfee brand is very well-known indeed, partly because trials of its security software are bundled with new PC builds. In this review I’ll attempt to discover whether all those people who take the easy route of paying when their free trial expires are making a sound decision. Minimum system requirements – will it run on your device? As you can see, the minimum requirements to get the program running are quite low indeed. You will, however, have to stop and ask yourself whether running any security program on a computer that relies on an outdated an unsupported operating system such as Windows XP is a good idea. Installation of McAfee AntiVirus Plus 2016 is both quick and simple. Once you’ve handed the cash over, you’ll sign up for a McAfee account (you only need to enter your email address and a secure password to do so) and then be given a download link and activation code. It’s important to jot this code down or add it to the clipboard – I forgot to do so the first time around and there isn’t an easy way to rediscover it (if indeed it is possible at all) and wasted a fair bit of time generating a new one by having to sign in and then download the installer again. One you’ve overcome that hurdle the program will begin to install. Type the code in or click control + V to paste it (right click and paste doesn’t work) and then you’ll be off and running. After a few short minutes – during which the program makes what looks like a quick and not-so-detailed check of your system for any existing malware – you’ll be good to go. 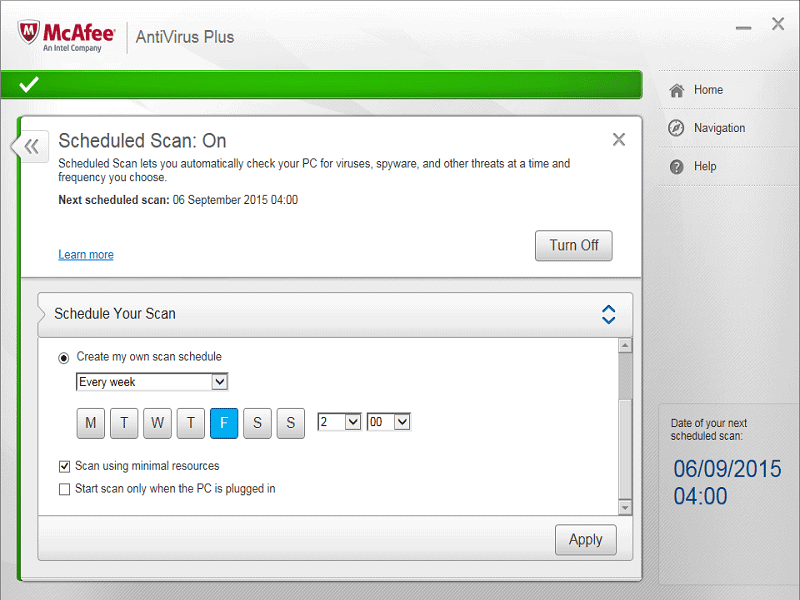 McAfee AntiVirus Plus 2016 features a simple and easy to use interface. Sporting a predominantly grey palette, the program displays a bold message at the top of the screen to let you know whether your computer is currently secure or not. In this instance, a huge splash of green and a large white tick are what you want to see. Additionally, the program offers a home link which, as suggested, will take you back to the front page of the interface, a navigation link which takes you to a page listing every feature in the program – a simple link granted, but if you’ve read my review of Kaspersky’s antivirus program you’ll also realise just how useful it is, and a help link which grants access to installed help files or a link to the company’s support website. Lastly, the bottom of the interface clearly displays the date and time of your next scheduled scan as well as a link to McAfee’s Threat Map which gives a great, but potentially scary, visual overview of how the world is fairing vs. the threats of malware and spam. McAfee AntiVirus Plus 2016’s main purpose is to protect your PC from all types of malware, including viruses, Trojans, spyware and rootkits, whether they are already on your hard drive or presented via the web, email or removable USB or optical drives. To that end, the program features on-demand scanning, scheduled scans and real-time scanning. 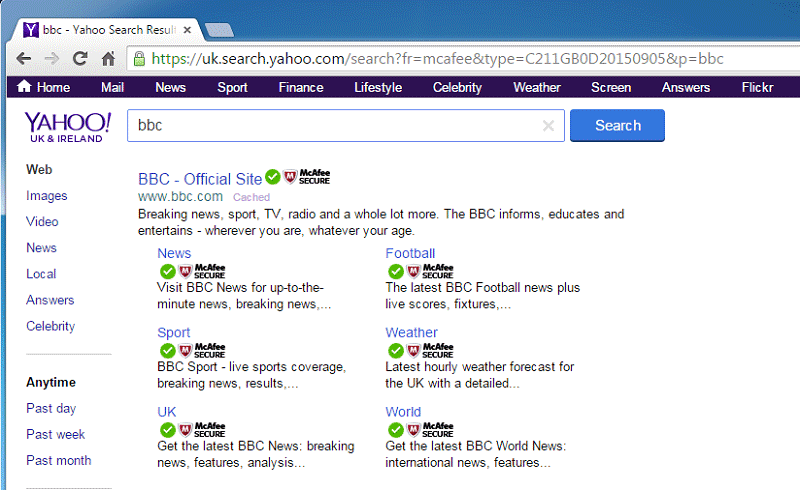 The program also features web-based protection in the form of ratings and reports which advise you which sites are safe – and which are not – before you ever click through to visit them. What’s interesting here is the fact that this feature can actually selectively block content on a given web site rather than the entire domain. This is a nice touch indeed. Beyond that, the software also offers something you don’t usually see in a standalone antivirus program – a firewall. In addition to the unexpected firewall, McAfee also includes a couple of other features normally reserved for more expensive internet security suites, namely file shredding and anti-phishing. The file shredder – which the company refers to as a Digital Data Shredder – provides a secure means of deleting your files. Normally, deleting an unwanted program, document or other file simply removes it from the index table on your hard drive. Until such time as that data is overwritten with something else, it is quite easy to retrieve with simple computer forensics tools. With the file shredder you can permanently delete files straight away in a manner that prevents them from being retrieved – highly useful if you ever deal with anything of a sensitive nature, from business accounts through to your own personal documents. To use the shredder you simply right click on any file and then choose Shred. You can configure the shredding operation via its setting page in the antivirus program itself, choosing between one of four options – Basic, Safe, Comprehensive, or Complete shredding. Each step progressively overwrites the file more times before deletion. In addition to shredding regular files, you can also do the same with temporary files and the contents of your Recycle Bin. If wiping out your old files is not enough, you also have the option of taking a scythe to your internet browsing history and email usage – McAfee’s QuickClean program can obliterate your browsing history as well as all your sent emails. You can preview what is about to be deleted before committing so the chances of accidentally removing something you wish to keep are slim. When it comes to the security of your computer, malware is not the only threat – you are too. Many people, for whatever reason, do not keep their operating system fully up to date with the latest service packs or the slew of regular patches thrown out by Microsoft. While Windows 10 has addressed that problem by forcing updates out to everyone, anyone still on an older version may be putting their device at risk by not consistently fixing new vulnerabilities as they are discovered. McAfee has this covered though – a vulnerability scanner will not only keep your Windows installation up to date, it will also take care of your outdated apps too. Both the Vulnerability Scanner and QuickClean can be run on demand or set to run every once in a while. 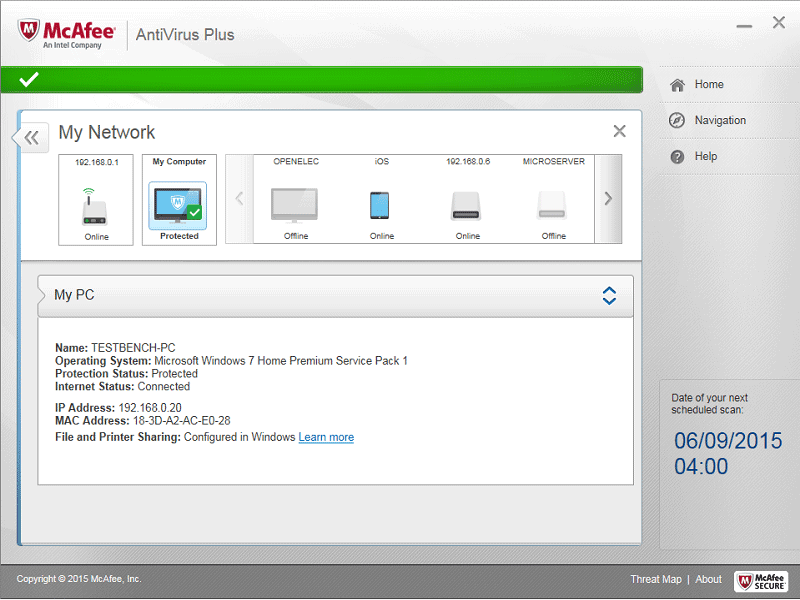 For what is very much an entry level security antivirus program, McAfee AntiVirus Plus 2016 offers an impressive list of additional features. Other included tools of note include a QuickClean tool that can automatically purge your system of junk files and erase your browsing history, website ratings and a warning system should you attempt to access a site that is questionable in terms of its own security. 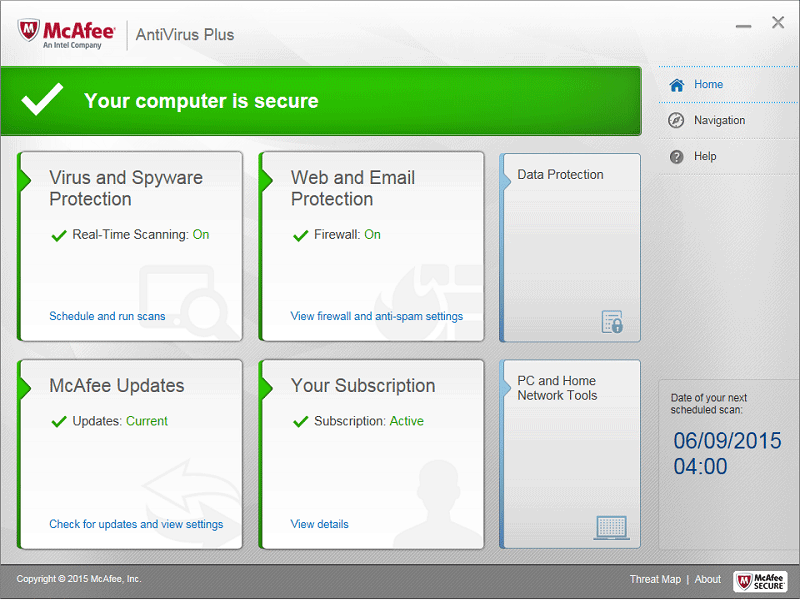 If you have the program installed on multiple computers in your household (a big disadvantage of this antivirus product is its single user license) then you’ll open up the My Home Network feature which allows each instance of the antivirus program to communicate with its brethren, giving you the ability to monitor the security status of your other PCs andf fix them remotely. I suspect this feature could be especially useful if your children have their own computers. Lastly, the program also sports a Threat Map which doesn’t really serve a quantifiably useful purpose but does look incredibly cool. 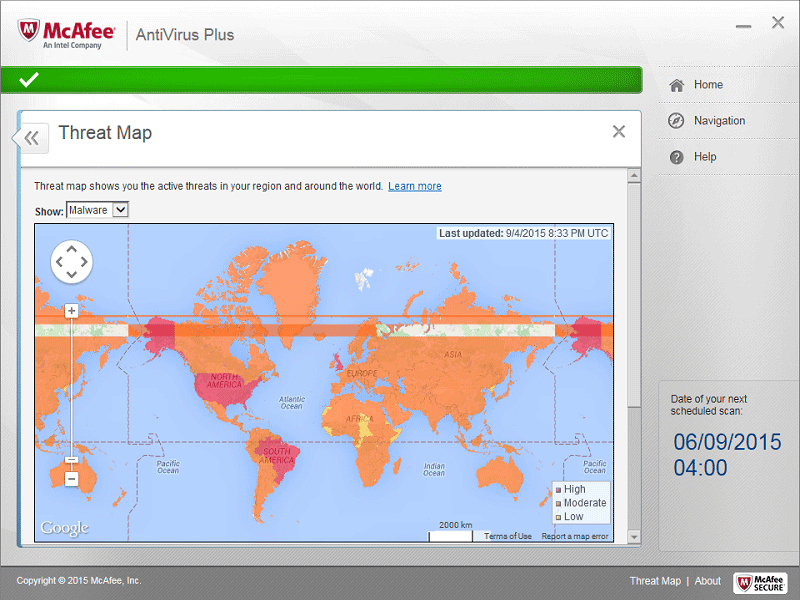 It uses colour codes to show which areas of the world are highly susceptible to, or responsible for, malware and spam at any given time. It also lists the current top 5 global threats. Once you get past the eye candy value of the map you’ll realise it won’t make your personal computer any safer but it is interesting nonetheless. For something more functional you’ll be better served by your own Security History which details what’s been happening on your own system. While extra bundled features are a nice touch, the question of whether or not an antivirus program is worth installing should always come down to how effective it is at blocking and removing malware. And on that front the program falls down a little unfortunately. Previously well regarded, the latest version of the program has struggled with independent testing this time around. In AV-Comparatives‘ dynamic test it failed to even achieve the lowest possible standard rating. Over at AV-Test, another highly regarded independent testing lab, McAfee AntiVirus failed to receive certification for either Windows XP or, more alarmingly, with the far more recent Windows 7. On other operating systems, such as Windows 8, the picture is immensely better though – AV-Test scored the program highly, almost on a par with the slightly preferred offerings from Bitdefender and Kaspersky. A bit of a mixed bag then really and something to make you think if you are still on one of Microsoft’s older operating systems. But what about the firewall? Given that it is an unexpected inclusion in an entry-level AV program, it may just swing things back in McAfee’s favour if its any good. Alas, that it is not the case though. While it offers positive features, such as intelligently making decision in the background without bothering a user who may not be qualified to choose what should or should not be allowed through, my testing revealed it was not quite as good at blocking exploits as the Windows equivalent. Given that its free that’s no great deal but it is certainly unfortunate that what looks like an excellent selling point is actually no better than a free alternative already sitting at your fingertips. That said, the convenience of having your antivirus and firewall in one combined package may be appealing to some of you, though not entirely necessary. 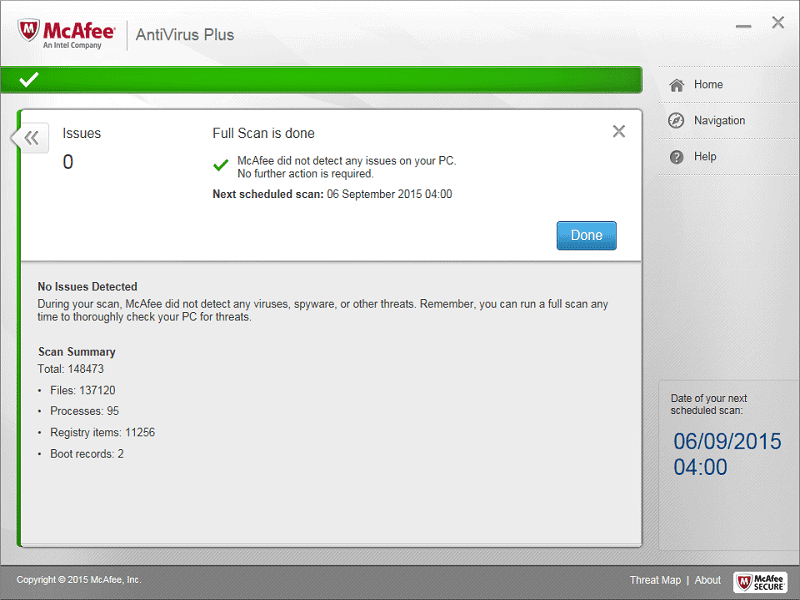 Running the first full scan with McAfee AntiVirus Plus 2016 took just a shade under half an hour which is an agreeable rather than excellent amount of time. That said, subsequent scans merely took a few minutes which suggests the program is concentrating on anything that has changed rather than taking the time to re-scan certain files unnecessarily. During the scanning process, CPU usage was high, peaking at 100% and averaging around 95%. That was not a problem though – I noticed no lag or slowdown when opening multiple web browsers or running any of the applications that are included with a clean Windows install. If your experience differs – and I doubt it will unless you are running a much older machine – you can adjust the virus scanner’s settings to lower resource usage at the expense of a less thorough scan. Likewise, you can also choose a more thorough scan, though that is likely to have a noticeable effect on the operation of your computer if you are multitasking. The only slight issue I had was when I deliberately introduced some malware to the system. Yes, the program discovered it, which is a good sign, but as part of the clean-up process it insisted on rebooting which was a bit of a pain given the fact that I was half way through writing this review at the time. Other than that minor grumble, I was pretty impressed though – updates to the software, which are an essential part of keeping your system secure, were very much noticeable by their unnoticeability, thanks to being downloaded in the background when I wasn’t otherwise using my computer heavily. Sometimes we all need help with the programs we install on our computers, be that from the get-go with installation, or on the other end of the spectrum in terms of understanding a more technical component. Most antivirus vendors do offer help, though the quality and availability of that assistance can vary quite considerably. With McAfee, however, you will almost certainly receive top level service. From within the antivirus program itself you will have access to an online help page which effectively serves as a trouble-shooting list of frequently asked questions. If that isn’t sufficient to answer your query then you can also get access to video guides, send an email in or chat to a customer service advisor. When speaking to someone I found the level of knowledge and competence to be excellent – you’d be surprised how many first line responders in tech companies are not very technical – though it is worth noting that such human interaction is only available Monday through Friday during regular business hours. Both the email and internet chat are free services. My overall impression of McAfee AntiVirus Plus 2016 is a mixed one. On the one hand, it is one of the more effective antivirus solutions available right now but it is not as good as, say, Bitdefender Antivirus Plus 2016 or Kaspersky Anti-Virus 2016. The inclusion of a firewall is an excellent bonus but there are better alternatives on the market and, dare I say it, Windows own in-built equivalent is just as good. That said, other additional features, such as anti-phishing and file shredding, are extremely welcome, especially as they are extras normally reserved for full internet security suites that tend to cost noticeably more than standalone antivirus programs. But, the license you get with McAfee AntiVirus Plus 2016 is for one PC only so, while it presents good value for owners of one machine, it does not generally offer the best bang for your buck if you have multiple PCs to protect. Therefore I would conclude that this program is well worthy of consideration if you only own one machine. If you are looking to protect several computers the recommended selling price is too high to make this a worthwhile purchase… but… McAfee has been known to offer up some pretty deep discounts on multi-license deals. If you ever see such an offer I say go for it!